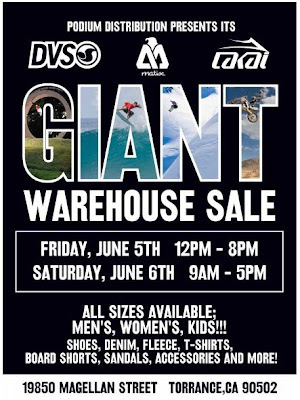 If you're in the Torrance area between June 5th and June 6, and enjoy getting hooked up with some of the coolest urban gear from DVS / Matix / Lakai, this giant warehouse sale at their corporate headquarters is a must. Check it out below. Tell your friends. Tons of products available: shoes, denim, fleece, t-shirts, board shorts, sandals, accessories and more. We at Qmania like spreading the word on warehouse sales and deals on high quality urban gear. Stuff like this is spread from Qmania directly via SMS and Email, too. Learn more here. Find other great apparel deals on Qmania here.